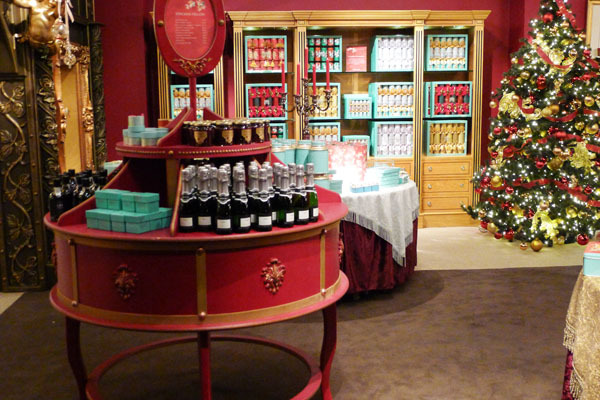 The Best Christmas Store Ever: Fortnum and Mason in London! It’s the perfect time of year to come to London! 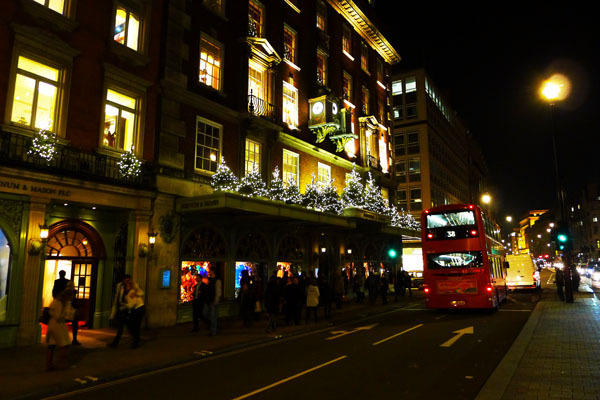 You’ll find Dickens Christmas spirit is everywhere… Here, we captured a red London bus driving past Fortnum and Mason. 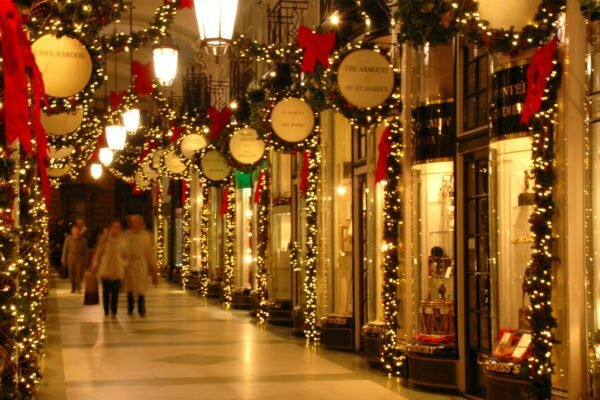 The Perfect Christmas in London! 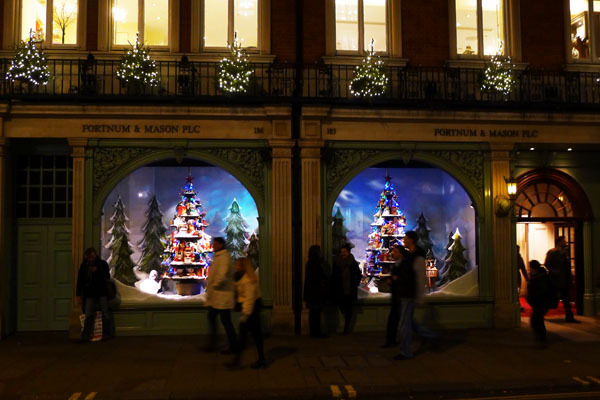 We universally voted Fortnum and Mason the best Christmas store in the world. 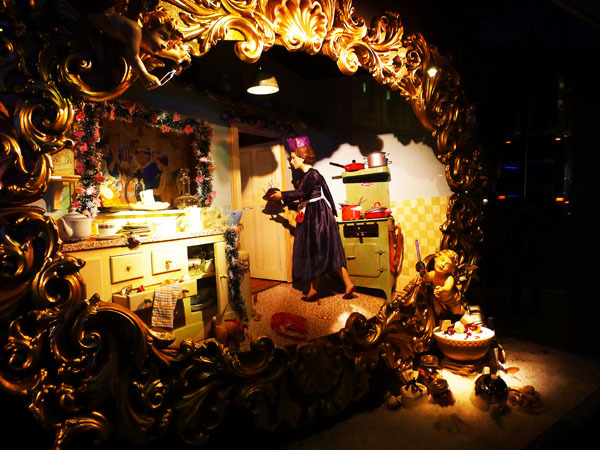 Everything, from the gorgeous display windows, outdoor lights to the individual departments were wonderful. 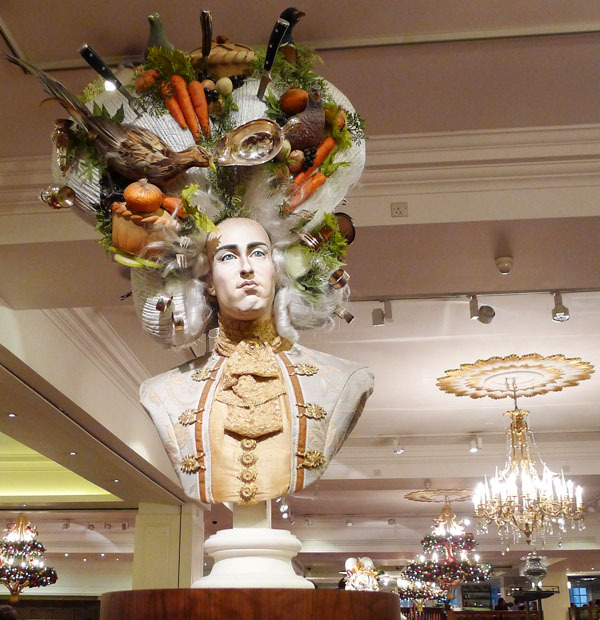 Founded in the 1700’s, Fortnum’s story is as interesting as the store. 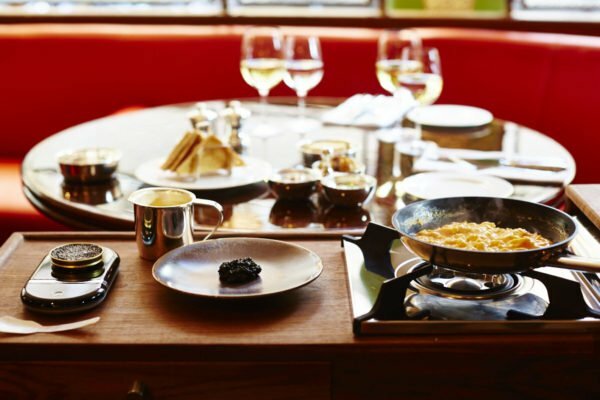 It was founded by a footman to the Queen, William Mason and his landlord who had a shop in Mayfair, Hugh Mason. 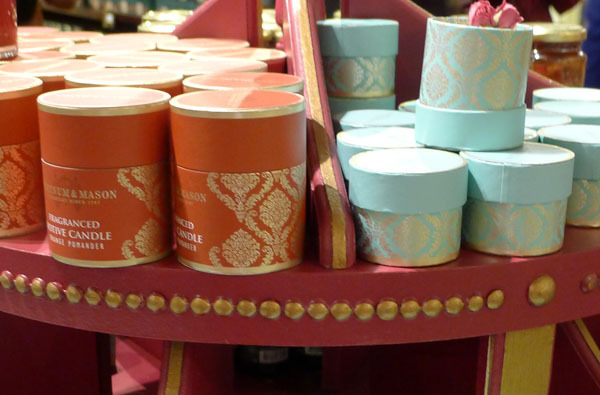 Fortnum noticed that the Royal Family insisted on buring fresh candles every ngiht of the year, which meant alot of leftover wax. As a sideline, he and William Mason melted down the excess wax and sold them to the public. The rest is history! 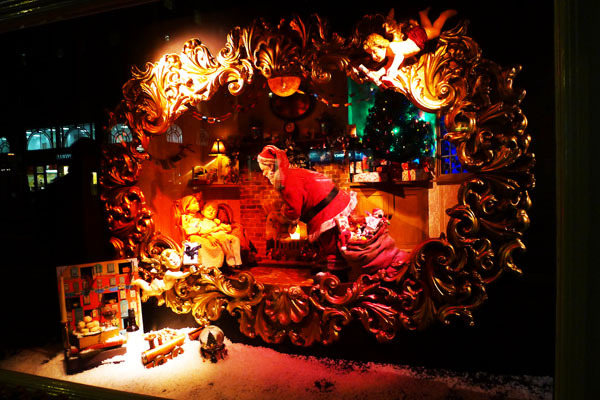 Most beautiful Christmas windows ever! 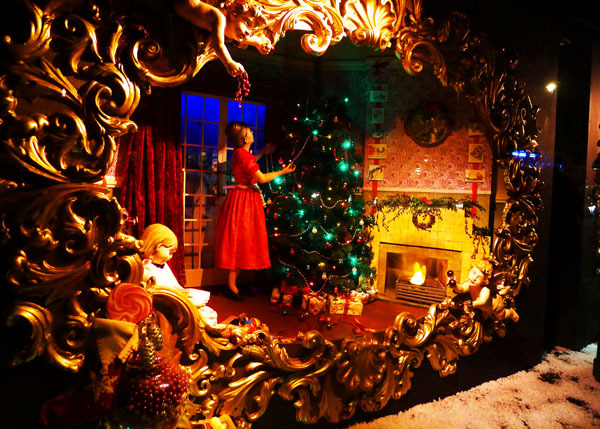 The window themes tell a story about ‘Christmas in England long ago’ … from Charles Dicken’s days to the 1950’s. 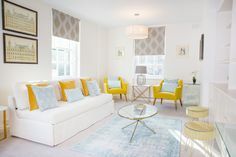 With fine detail and stories in each scene, they have attracted thousands of families, who are entranced. A miniature scene of Dicken’s Christmas Carol, with carollers singing on the street outside a Victorian mansion. The quality and detail are astonishing. You could spend an hour on each window. To a scene from the 1920’s where a mother is bringing in Christmas dinner. Notice the paper crown on her head. 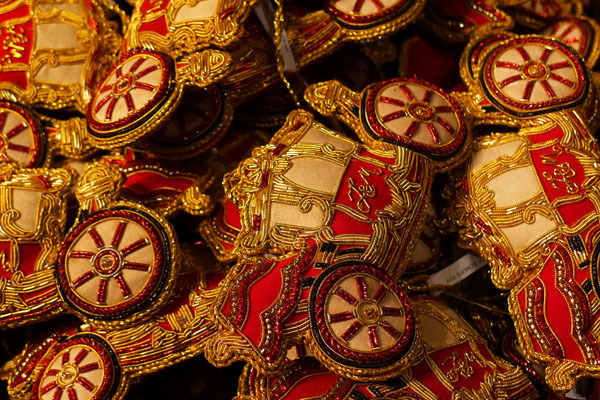 English families buy Christmas crackers of every shape and style. They pop them open and wear these funny hats for dinner. Old fashioned style window. Preparing dinner in the old servants quarters — by a modern 1920’s mum. To a 1950’s scene with mum in red dress decorating the Christmas tree. 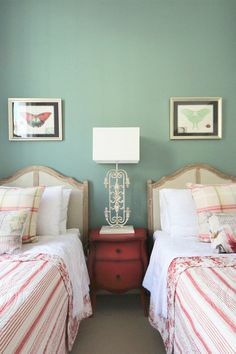 We couldn’t believe the marvelous detail in each of these scenes. 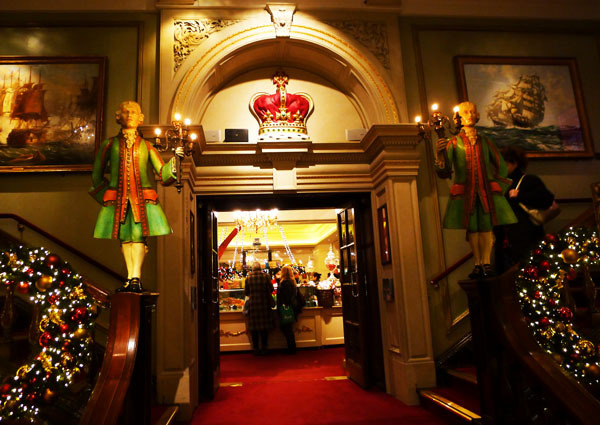 Step into the entrance of Fortnum’s to find the Royal seal and crown above the doorway. You’re greeted by carved life-sized footmen on each bannister. 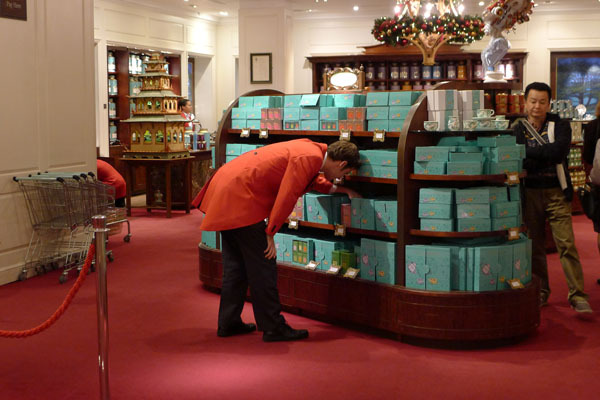 When you step into the store, you’re transported in time to 1707, the year Fortnum and Mason was founded. 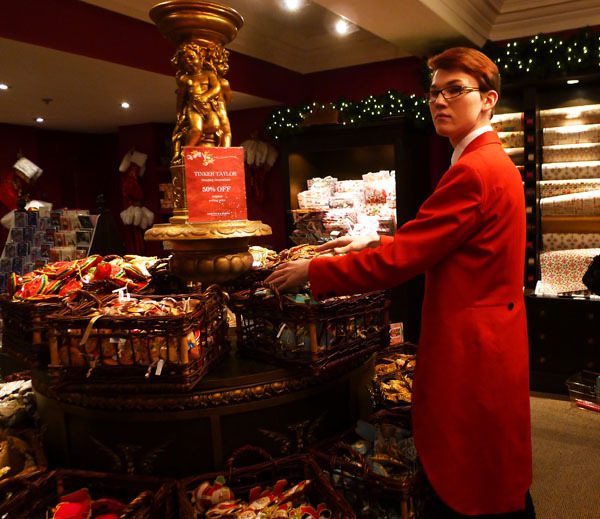 The famous carved footmen at the side entrance to Fortnum’s. 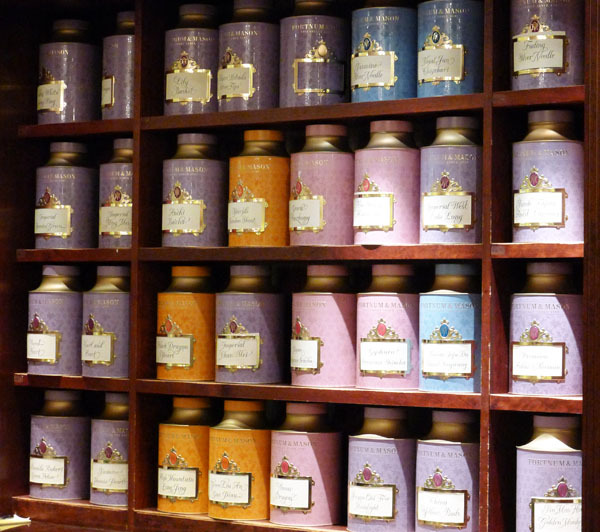 In 1744 the East India Tea Company was founded and became a power unto itself. 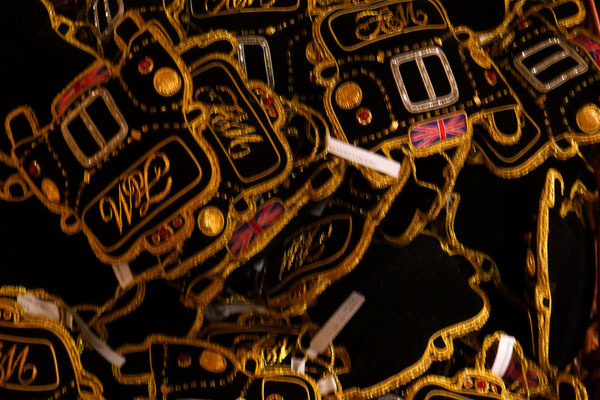 The Company became one of the strongest exporters in the world and introduced the English to …. tea! 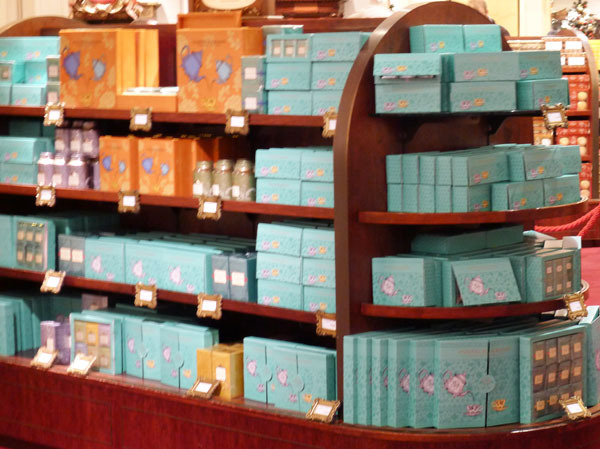 A number of Fortnum’s were employed by the East India Tea Company, which meant Fortnum and Mason was at the forefront of tea, spices and other imports. 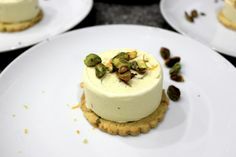 It slowly evolved into a gourmet grocery store. The descendants claim it was probably NOT their tea which was thrown overboard on that fateful day in Boston Harbor: ‘because our tea has always been very reasonably priced’. 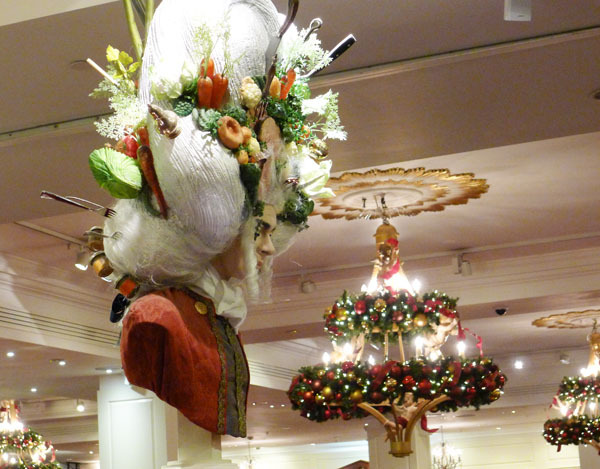 Read more about Fortnum’s History ! The inside of the store is fabulous! 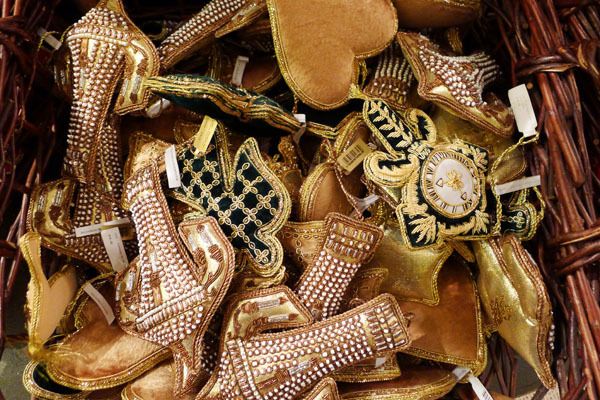 Each department has unique and excellent products — it’s a one of a kind shopping experience. 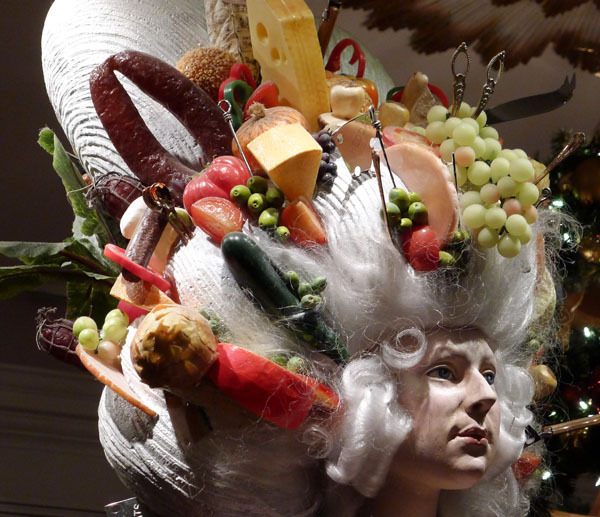 Apples, forks and foods in stylish wigs! 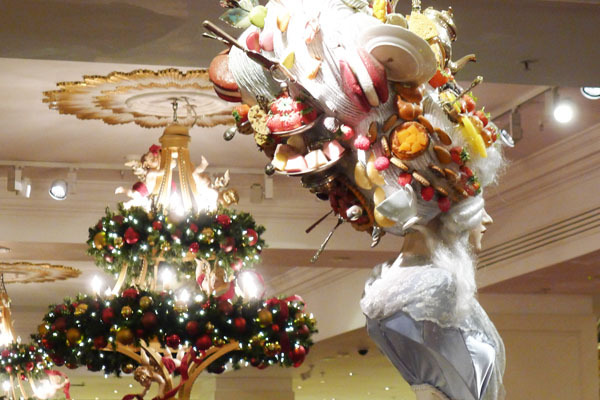 we loved the series of mannequins wearing enormous white French wigs that were decorated with luxury foods… showing their artistry and originality! Carrots and oyster in French man wig! We think the English love to ‘take the Mickey’ out of the snobbish French, seen by this French and his enormous wig above. Or the close ups of the Noble French woman — with the knives and forks in their wigs, it’s definitely Des Liasons Dangereuses. 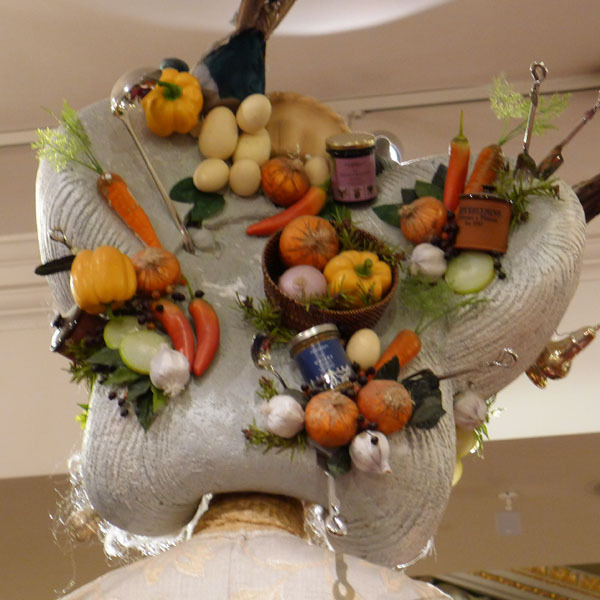 White wig closeup; how about carrots and potatoes and pate’ in your hair? 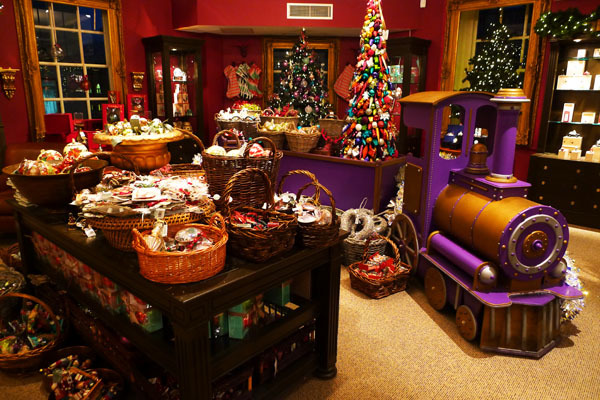 Head upstairs to the Christmas department, the most magical you could find. . Children are enchanted by the purple train, baskets full of miniature decorations, Christmas crackers, beautifully decorated Christmas trees and decorations. We couldn’t resist purchasing some of the hand-made Christmas decorations — produced especially for F and M! 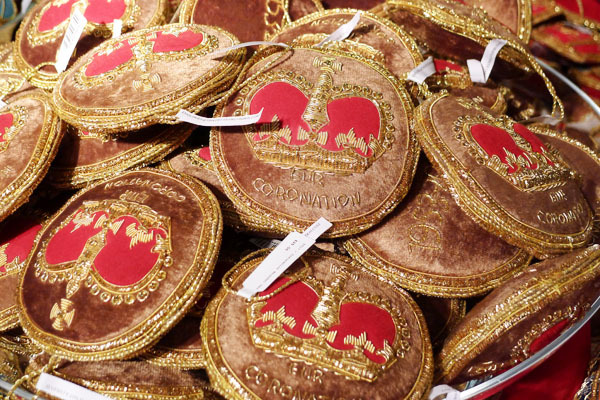 First basket is the Queen’s crown… These make wonderful small gifts for friends and family, all year round. 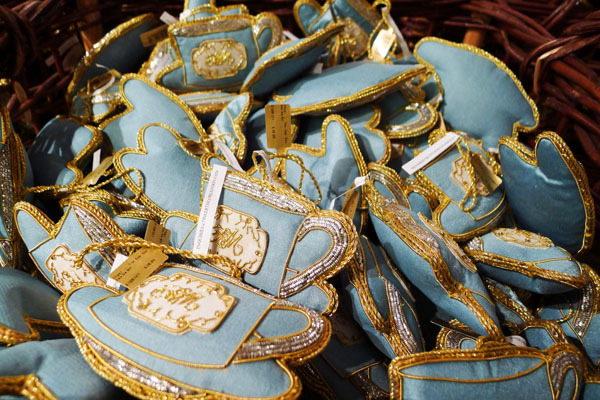 And the Royal Carriage — Fortnum’s delivers tea to Buckingham Palace in a carriage…. 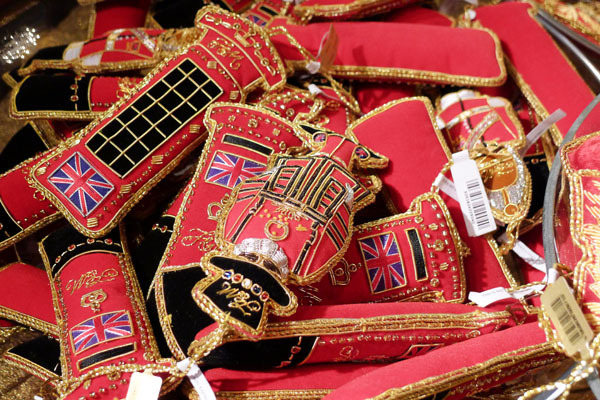 A perfect small gift or souvenir from your trip to London is this black London taxi christmas decoration! Favorite small gifts: scented candle and round box with Knowledge Quizz! 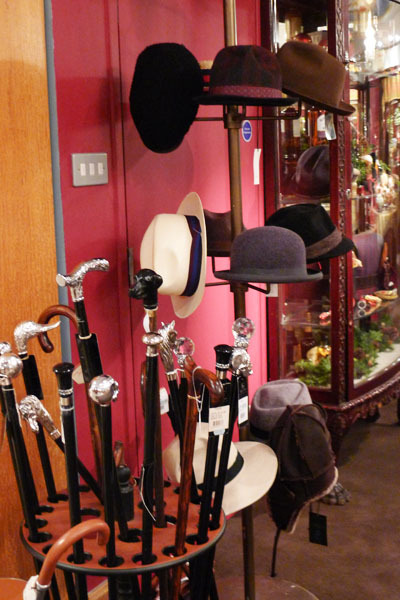 Men’s canes and hats — so veddy English! 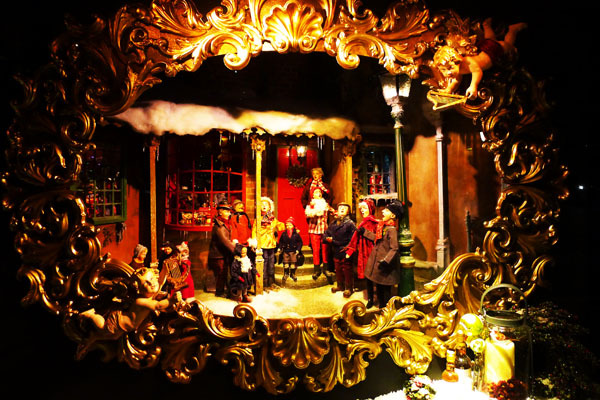 We hope we’ve put you in the holiday spirit and that you’ll come to London for Christmas to see and experience this magical time! PREVIOUS: Get Your Tickets for the Chelsea Flower Show 2014! 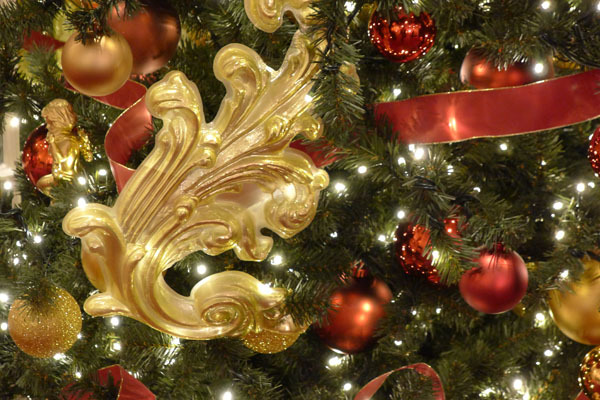 NEXT: Happy Holidays – Win a Gourmet Tea & Cookies Gift Basket! 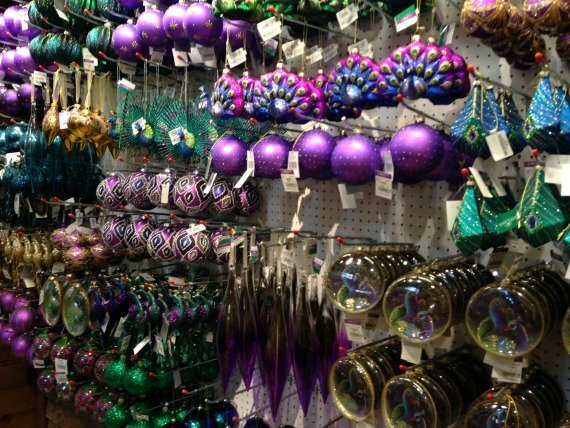 Posted on Monday, December 16th, 2013 at 6:07 pm in Shopping. You can follow any responses to this entry through the RSS 2.0 feed. You can leave a response, or trackback from your own site.